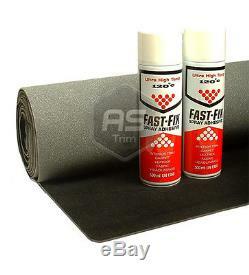 Headlining Black Textured Polyester Foam Backed Roll 3m long x 1.6m wide x 3mm thick scrim foam. + 2 Fast Fix High-Temperature Resistant 120°C Aerosol Spray Adhesive. A 3m roll of Black Textured soft 220g polyester automotive headlining material with a high density 3mm fire-retardant scrim foam backing. 2 Cans of Fast Fix High temperature resistant 120°C Spray Glue Adhesive will avoid headlining sagging in hot summer months. Extra wide 1.6m width makes it ideal for replacing sagging headlining in Ranger Rovers and Land Rovers etc. Modern slight textured fabric weave as used by most luxury car manufactures such as Vw Audi, Mercedes and Bmw. Ideal for re trimming of headlining in automotive and some marine applications or in exhibition panels. Headlining is very stretchy which makes it easy to manipulate and can trim complicated shapes with out wrinkling. Other lengths available by request. This is not a pvc vinyl type product! All items will be sent using suitable packaging materials. Free P&P to England and Wales and some parts of Scotland only. AB31 to AB38, AB40 to AB56, HS, IM, IV1 to IV63, KA27 & K28, KW1 to KW17, PA20 to PA78, PH4 to PH50, ZE, Northern Ireland BT & Channel Islands. A signature is needed for all courier deliveries. The item "3m x 1.6m Extra Wide Headlining Textured Black FoamBacked + 2 Hi Temp Spray Glue" is in sale since Monday, September 2, 2013. This item is in the category "Vehicle Parts & Accessories\Car Parts\Interior Parts & Furnishings\Headlining". The seller is "as-trim" and is located in Ipswich. This item can be shipped to United Kingdom.